Sushama Ranganathan, Bharatanatyam Dancer, Tamil Nadu, India - Sabhash! Sushama Ranganathan has been trained in the firm Bharatanatyam discipline of the Legendary Smt. T. Balasaraswati, by Nattuvanar Sri. K. Ganesan (son of Sri. Kandappa Pillai, the mentor of Smt. T. Balasaraswati) and her mother Smt. Nandini Ramani, prime disciple of Smt. T. Balasaraswati. In 1987, Sushama’s debut was conducted by Nattuvanar Sri. K. Ganesan, who accompanied Bala for over 3 decades. Between 1988 and uptil now, Sushama has been performing for various cultural organizations in Chennai and outside which include the Music Academy, Narada Gana Sabha, Sri Krishna Gana Sabha. Bharat Kalahcar, Kartik Fine Arts and Brahma Gana Sabha. She has performed at all these cultural platforms in Chennai also during their December Dance-Music festivals. She was awarded the Balasaraswati Memorial Prize for the Best Dancer, at the Pongal Dance Festival of Sri Krishna Gana Sabha. One of her noteworthy performance was at the prestigious Navaratri Mantapam of the Travancore Royal Palace during its Navaratri Festival performed before an august gathering which included Maharani Karthikai Tirunal and Ilayaraja Sri Marthanda Varma. At Dr, V. Raghavan Centre For Performing Arts, founded by her mother and Guru Smt. Nandini Ramani, Sushama assists in training students in the dance tradition of T. Balasraswati and continues her artistic work and furthering of her skill both in repertoire as well as in Nattuvangam technique of this school. Sushama has endeared herself to blossom into a well equipped Bharatanatyam artiste by honing her skills in the sphere of Carnatic Music which is an integral part of Bharatanatyam. She has learnt Carnatic Music from Prof. B. Krishnamurthi of the renowned lineage of Mudicondan Sri. Venkataramier. Sushama’s musical training has helped her to understand the inter-relation of music and dance, a very special feature of the “Bala Tradition”. As the grand daughter of the illustrious Sanskrit scholar Dr. V. Raghavan, Sushama has been groomed with great interest for acting in Sanskrit plays from an early age. She has participated in all the major plays produced by her mother at Samskrita Ranga, an organization founded by her grand father Dr. V. Raghavan and has enacted major roles, receiving accolades at prestigious festivals like the Kalidas Festival at Ujjain. Married to well known media personality and singer Sri. T.S. Ranganthan (a disciple of Sangita Kalanidhi Palghat Sri. K.V. 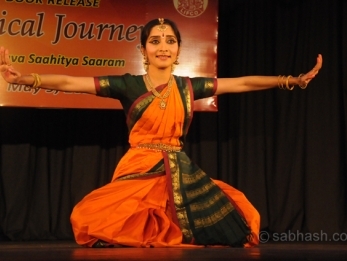 Narayanaswamy), Sushama continues her artistic career with great devotion and dedication. She has furthered her artistic activities by focusing in production of Audio CDs and Dance DVDs at SURANG STUDIOS under the banner of Gitaa Cassettes, which are very popular in the present cultural scenario; Sushama is also engaged in promoting Fine Arts through publication of books on Dance Treatises with English Translation. Sushama, a graduate in Mathematics, holds a PG diploma in Computers. Sushama has proved a steady growth in her artistic career and has won accolades, in addition to several prizes and awards that she has received at school and college levels for her skill in overall artistic accomplishments. Sushama was featured as one of the main actors in a major documentary of the Ministry of External Affairs, Govt. Of India titled “Nauka Charitramu – A boat Story” focusing the three great legends of Carnatic Music – Smt. M.S. Subbulakshmi, Smt. D.K. Pattammal and Smt. T. Brinda. This film won several awards and recognition at the global level. Sushama is also well known in the Television media through her appearances in commercial programs. Sushama, donning the role of Sakuntala, was every inch a replica of Kalidasa’s creation. Her figure, deportment, her felicitous movements, her furtive glances, here eloquent bashfulness, her poignancy when she prevailed to send a love letter to Dushyanta and finally her tormented soul when she had to leave her trees, bowers, deer and her companions, were all done with consummate delicacy and refinement that she stole the show. What stood out was the superlative acting of Sushama as Anarkali. The moods of her love, expressed through subtlest movement of her doe-eyes and her despair in jail expressed in an understated manner and not least, her Bharatanatyam full of grace, all combined to stamp her as a brilliant actress. Kudos to her professional gloss.